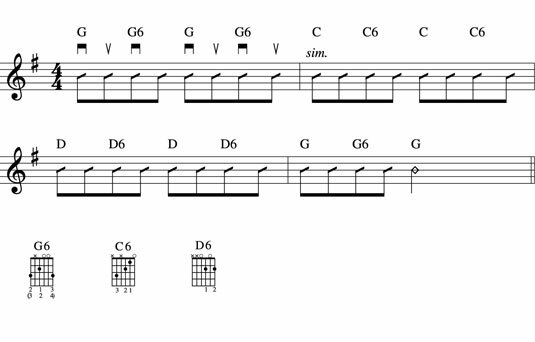 The shuffle is an important rhythm feel used extensively in rock guitar. A shuffle is a lilting eighth-note sound created by dividing the beat into two unbalanced halves, a long note followed by a short. Think of the riffs to such songs as Elvis Presley’s “Hound Dog,” the Beach Boys’ “California Girls,” Fleetwood Mac’s “Don’t Stop Thinking About Tomorrow,” and the Grateful Dead’s “Truckin’.” These are all based on a shuffle feel. The shuffle is formed from triplets, where the beat is first subdivided into three equal parts. Then the first two notes are held together. That’s the sound of normal, equally spaced, straight eighth notes. Fol-low the yel-low brick road. That’s the sound of triplets. In both cases you should keep your foot tap at exactly the same tempo and change only how you subdivide the beat internally. Create shuffle eighth notes by sounding only the first and third notes of the triplet. To do this, sustain the first note through the second, or leave out that second note entirely. The new sound is a limping, uneven division that goes l-o-n-g-short, l-o-n-g-short, l-o-n-g-short, and so forth. The bold type represents the beat, where the syllables coincide with your foot tap or finger snap. The phrase “Johnny comes” is in triplets, because each syllable falls on one note of the three in between two beats. The rest of the phrase, “marching home again, hurrah” divides each beat into two-syllable pairs, the first syllable longer than the second syllable. This is the sound of eighth notes in a shuffle feel. The following figure is a shuffle feel that uses downstrokes and upstrokes. To reward you for saying “twinkle, twinkle little star” out loud while you tapped your foot, I’m going to give you three new bonus chords that are easy to play and will give your shuffle progression a real lift. An eighth-note shuffle in G using downstrokes and upstrokes. You can play the three new chord forms by moving one finger from the existing chord from which it is derived. Actually, the chords aren’t so much new as they are a one-finger variation of chords you already play. These “new” chords are easily executed by moving one and only one finger, while keeping the others anchored. The upstrokes still come at the in-between points — within the beats — but because of the unequal rhythm, it may take you a little time to adjust.